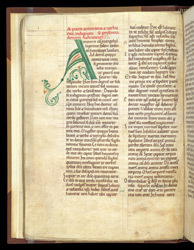 Belonging in the Middle Ages to the cathedral priory of Rochester, this manuscript contains a large collection of St Augustine's sermons, mostly on parts of the New Testament. Its attractive bold handwriting is further enlivened by elaborately decorated letters beginning three sermons, while the others have large coloured first letters. Augustine (354-430) was one of the great preachers of early Christianity, his hundreds of sermons being copied many times and distributed throughout the medieval western church. This copy of his sermons may have been read from during the daily prayer services of the canons and monks--although it is not organised according to the calendar of feast days--and probably was used as a resource for the writing of sermons to be delivered at mass. In its first section the manuscript has sermons on the words of Jesus in the Gospel of Matthew, arranged according to the quotations' order in the gospel. Here is Augustine's sermon on the healing of the centurion's servant (Mt 8:5-13). While the forms of the letters and the graceful, balanced decoration of the coloured first letters are skillfully executed, the manuscript was a working book: the finger-prints on its pages attest to its frequent use as a reference or service book.